I have known Dr. Mari Kusumi, President of the University of Human Arts and Sciences, for fifteen years and have always been impressed with her advocacy for “lifelong health” and the inherent connection of “Mind and Body”. Health Sciences of Mind and Body synthesizes her philosophy and cogent perspectives on health issues and lifelong health – “Knowledge for well-being”. Her writing, as well as that of twelve contributing scholars, provides compelling evidence of the movement towards integrated medicine which empowers individuals to achieve “lifelong health”. The research presented is current, well documented and refreshing. Dr. Kusumi is to be commended for her insight and her foresight in remaining open to new ideas and advocating exemplary research. This book provides a refreshing view of health care with emphasis on interdependence. Her advocacy of knowledge for well-being is the common thread throughout the book. Health Sciences of Mind and Body will most certainly be widely read while adding a vital contribution to our knowledge base. In our increasingly fast-paced and often chaotic world, experiences of stress and their consequences for the mind and body are of central concern for many people, involving problems with maintaining both mental and physical health. Besides major life events such as death, divorce and job loss, these stress-related factors include frictions of daily family, commuting and working life, problems in relationships, financial concerns, irritations from seeing violence and disruptions depicted in the media. Moreover, abuse and neglect of children is a problem that is not confined to the poor and is often a reflection of the troubles experienced by the parents themselves. Early life adversity has life-long consequences for mental and physical health 1) and early life interventions to facilitate positive parent-child interactions can have powerful and lasting benefits for individuals and society 2). Coping with these concerns and educating the next generation of citizens and professionals toward the concept of “positive health” , also embodied in the notion of “well being therapy” 3), is a central mission of the University and Graduate School of Human Arts and Sciences. According to its President, Dr. Mari Kusumi “We have the mission of educating professionals who can support the health and happiness of people. We are trying to achieve an educational environment to bring up students to develop self-reliance and also interdependence through exposure to the health sciences of mind and body.” To achieve this mission, the University and Graduate School of Human Arts and Sciences have developed a teaching program with a textbook entitled “Health Sciences of Mind and Body”. Reflecting the philosophy of the University of Human Arts and Sciences, the approach of the book is “holistic”, which is defined as “a comprehensive perspective of the whole person, not just parts” and including “the biopsycho-social perspective” that emphasizes the powerful role of the inter-personal and broader social environment upon health and disease 4). It is also noteworthy that “mind” is used instead of brain because the “mind” encompasses the feelings and sensations of the whole individual, in which, of course, the nervous system plays a central and essential role in responding to and coping with stressors5, 6). Moreover, the more holistic view of the mind-body interaction recognizes the protective and damaging actions of the network of biochemical mediators in body and brain of stress and adaptation, including hormones like cortisol and adrenalin and inflammatory cytokines, that are embodied in the concepts of “allostasis” and “allostatic load” 5, 6). In the text book there is chapter on “The Foundation of the Mind-Body Correlation” that systematically elaborates the basic functions involved in brain-body interactions, brain development and growth, and the brain in relation to mental health. The next chapter “Understanding the Mind-Body Correlation” includes sections on the immunology of mind and body, the effects of nutrition and diet, empathic communication between parent and child, successful aging and a woman’s life cycle. Chapter 4 of the book is entitled “The Development of the Health Sciences of Mind and Body” and includes sections on mental health management, health promotion, and a broad discussion of evolution and the history of biomedicine leading to the DNA era and the possibilities of genetic manipulations, along with a discussion of bioethics. The authors of the sections in the book are themselves accomplished teachers and researchers with extensive experience and careers in psychology, neuroscience, endocrinology, biochemistry, pharmacology and other aspects of biomedicine. 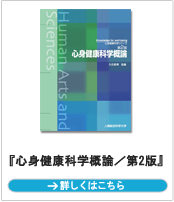 The supervising editor is Dr. Mari Kusumi, President of the University of Human Arts and Sciences and of the Japan Society of Health Sciences of Mind and Body, holding master of clinical psychology and doctor of medicine as well. The Health Sciences of Mind and Body is a teaching program that is an essential part of the curriculum at the University and Graduate School of Human Arts and Sciences. It is required for students who do “distance learning” and hold jobs as well as other undergraduate programs in both the Faculty of Human Arts and Sciences and the Faculty of Health Sciences. 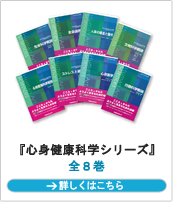 One can hope, not only that this will have a significant effect on the next generations of Japanese citizens, but also that the model of this very interesting text book and teaching program will spread within Japan and also to other countries and be propagated throughout the world. 1. Anda RF, Butchart A, Felitti VJ, Brown DW. Building a framework for global surveillance of the public health implications of adverse childhood experiences. Am J Prev Med. 2010;39(1):93-8. Epub 2010/06/16. 3. Fava GA, Rafanelli C, Cazzaro M, Conti S, Grandi S. Well-being therapy. A novel psychotherapeutic approach for residual symptoms of affective disorders. Psychological medicine. 1998;28(2):475-80. Epub 1998/05/08. 4. Engel GL. The need for a new medical model: A challenge for biomedicine. Science. 1977;196:129-36. 5. McEwen BS. Protective and Damaging Effects of Stress Mediators. New England J Med. 1998;338:171-9. Health Sciences of Mind and Body is an excellent textbook, which explains life from the perspective of different relationships. Life phenomenon such as the mind and body, self and non-self (immune system), nutrition, metabolism, and nervous systems are all maintained through dynamic equilibrium. Problems concerning the relationship between elements and that between mechanisms are highlighted in the book. A special feature of the book is that it also considers the relations between life, culture, and ethics. Human beings have an ability to face any obstacles naturally. So, we can feel “life worth living” no matter what environment and health condition are. Health Sciences of Mind and Body provides “knowledge for well-being”, which, is the essence for human beings to obtain “life worth living”. In the 21st century, science is developing with astonishing speed beyond the boundary of existing academic fields. In this context, from a broader point of view it is now important to think of how an individual scientific outcome will develop into a wider new field. One may call this way of thinking “Holistic Approach”. The Health Science of Mind and Body is a new academic discipline to understand the human beings as a whole by the holistic approach through interdisciplinary research on “life”, “health”, and “human”, in particular paying attention to the correlation of mind and body.. In this book readers can study a scientific approach to solve the health problem of mind and body, which is a modern health issue. The 21st century has long been heralded as the age of the mind, and psychological well-being is now considered an integral par t of health. The aim of “health sciences of mind and body,” an academic field of this book, is to address the organic relationship between m ind and body and to scientifically, theoretically, and empirically map out va rious phenomena associated with mind-body correlation, and thus carry out a holistic inquiry into human health. It is an attempt to compreh ensively view and integrate a wide range of fields outside of co nventional health sciences, including life science, behavioral science, st ress science, psychosomatic medicine, basic medicine, bioethics , and cultural science to thus elucidate the correlation between the mind and body as well as the mechanisms that govern life.